Minimalist Duplicate Files Finder. Yet With Features. The idea to organize data as files appeared simultaneously with the first computers. Those “monsters” were so big, they required dedicated rooms. During the decades of evolution computers went through the stages of primitivity and unmanageable complexity, until we've got today's Macs. One thing, nevertheless, remains the same — files. Truth be told, few people succeed in their management. 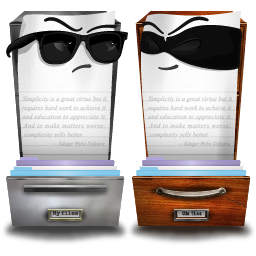 Bring order to file chaos on your Mac today, use Singlemizer to remove unnecessary file duplicates. Files and folders, available for scan can be located on any mountable drives: internal and external hard disks, USB flash drives or network shares. Put a well-organized folders at top of the list and leave undesired ones at the bottom. The order of folders hints Singlemizer how to choose original files among numerous copies. Singlemizer forms duplicates' list as files are identified. Feel free to work with the results while more files are being processed in background. Do you want to see only duplicates of a particular type, for example, only folders or images? Use metagroups to filter out files of no interest. Sorting by numerous criterias, such as wasted space and duplicates' count allows to show the most interesting files high on the list. “One look is worth a thousand words…”? Any found files could be previewed right in the app using standard Quick Look panel. All files marked for removal are listed in a single list for your convenience, so you can make sure you remove only unnecessary files. Besides moving files to trash, Singlemizer can also free disk space by replacing duplicate files with links to the corresponding originals. Aliases, symbolic links and even geeky hardlinks at your service. Trial version has no limitations and provides all features, except the ability to remove files from the application. After test-drive you can purchase Singlemizer and unlock it with a supplied serial key.